Get all the updates on elections here. Sanjay Singh, AAP: In order to stop BJP we were ready for an alliance with Congress, but Congress is not in a mood for any coalition. It is a matter of sadness, that even after so many efforts, Congress is not ready for any kind of compromise. Biju Janata Dal (BJD) files a complaint with Election Commission demanding action against Dharmendra Pradhan for allegedly 'misbehaving and preventing govt officers from conducting their duties of checking his helicopter along with a sealed suitcase in his possession yesterday'. In Kashmir, a Congress ally is saying that 'if anyone will abuse Pakistan, I will abuse India even more.' Congress is standing with such people, can any citizen of Gujarat do the mistake of voting for such people? asks PM Modi. PM Modi addresses another public rally in Gujarat's Anand. Karnataka: Chincholi Assembly by-poll to be held on 19th May, counting on 23 May. BJP releases list of four candidates for Lok Sabha Elections 2019 in Madhya Pradesh; Sadhvi Pragya Singh Thakur to contest from Bhopal against Congress's Digvijaya Singh. Election Commission flying squad checks luggage of Chief Minister and BJD president Naveen Patnaik at a helipad in Rourkela. Congress national spokesperson Priyanka Chaturvedi hits out Congress after party leaders reinstated some leaders who had recently misbehaved with her. “Deeply saddened that lumpen goons get preference in Congress over those who have given their sweat & blood. Having faced brickbats & abuse acrossthe board for the party but yet those who threatened me within the party getting away with not even a rap on their knuckles is unfortunate (sic),” she tweeted. Derek O'Brien, Trinamool Congress on BJP claiming they will win 30 out of 42 seats: BJP people are also saying they will win 50 out of 42 seats as they don't even know how many seats are there. Let them dream, ppl of Bengal are with Mamata Banerjee and TMC. May 23 we'll see where these people hide. NCP Chief Sharad Pawar: How will he (PM Modi) know how to run a family? That's why he peeps in others' homes. I can say more also but I don't want to stoop to low-level. Sharad Pawar: Modi Ji says 'Pawar Sahab is a good man but has family issues. His nephews are out of his hands.' I wanted to ask him what does he have to do with issues at my home? But then I realised I've my wife, daughter; son-in-law, nephews visit us, but he has no one. We appeal to Election Commission to give a notice to Ashok Gehlot and to give a directive that no political party should make a remark critical of the President of India, GVL Narasimha Rao said while addressing a press conference. Union Minister Piyush Goyal: Rahul Gandhi is afraid of defeat in Amethi and has to run all the way to Wayanad... he has lost the confidence of people of India. I am sure the people of Kerala will defeat him so that in the next election, he will have to look for a constituency in some other country. BJP won't allow two prime ministers in India: Amit Shah. The Election Commission has appointed former Bihar Chief Electoral Officer (CEO) Ajay VNayak as special observer for West Bengal, a senior official said on Wednesday. Complaint filed with State Women Commission against BJP candidate from Mysuru Pratap Simha for alleging mentally and physically harassing a woman. Hitting out at BJP, Navjot Singh Sidhu said, "I was born in a Congress family, don’t talk to me about nationalism. A person who sidelined such senior leaders like Advani and Joshi ji, he has made BJP a private limited company which is run by only two people and both are Rahu and Ketu, charted accountants like Nirav Modi and others. What kind of nationalism is this where the stomach is empty and you are teaching yoga. No food to eat but toilets are being made." Union Minister Suresh Prabhu reaches Matoshree to talk to Uddhav Thackeray about the poll campaigning strategy for coastal Maharashtra. The Indian National Lok Dal (INLD) announced the names of candidates from 6 seats in Haryana. For the Rohtak, Gurugram, Kurukshetra and Mahendragarh seats, names would be announced soon. Ravi Kishan, BJP candidate from Gorakhpur: What derogatory comments are being made on women! Jaya Prada ji is a sr in our industry, we respect her a lot. Just because she has come to Rampur to contest elections you will comment on her? Dignity should be maintained during election. Madan Mitra, TMC on TMC leader Anubrata Mandal reportedly threatening Central forces: I didn't see the statement of Anubrata. Yes, we are not afraid & not suffering from fear psychosis. The central forces may be with BJP but the people of Bengal are with Mamata. CPI candidate Kanhaiya Kumar was surrounded by angry locals in Begusarai during his campaign and was questioned over his 'azadi' slogans. I'm not like PM of India, I'll not come here & lie to you because I respect your intelligence, wisdom & understanding. I don't want to have a relationship of couple of months with you, I want to have a life long relationship with you, says Rahul Gandhi in Wayanad. Bihar Chief Minister and JD(U) leader Nitish Kumar will address rallies in Supual, Jhanjharpur and Madhepura. RLSP candidate Akash Singh will also file his nomination from Motihari in the presence of Shatrughan Sinha, Jeetan Ram Manjhi and Upendra Kushwaha on Wednesday. "When CBI went to SC, Lalu sent his messenger Prem Gupta to Arun Jaitley, asking to not let CBI appeal to the SC in the case. He said that if they get help '24 ghante mein Nitish Kumar ka ilaaj kar dunga'," said Bihar Deputy CM Sushil Modi. I understand there are complex problems here. I am not here to tell you my Mann Ki Baat...I want to know what is in your hearts, Rahul Gandhi said while addressing a rally in Wayanad. For the last five years, we are fighting the ideology of Narendra Modi and RSS. And the thinking of their ideology is that one person should only rule, Rahul Gandhi said in Wayanad. Rahul Gandhi addresses a public meeting in Wayanad, Kerala. Madhya Pradesh: Sadhvi Pragya Singh Thakur has arrived at the BJP office in Bhopal and is currently meeting senior BJP leaders Shivraj Singh Chouhan, Ramlal, and Prabhat Jha. Pawar steeped in dynastic politics; his model is a special (Gandhi) family in Delhi: PM Modi. Why label entire backward community thieves by calling, says PM Modi targeting Rahul Gandhi. People braving scorching heat to hand over India's reign to Modi again: PM Modi. Those sitting in AC rooms in Delhi and keeping a tab on things which will happen after who hugs whom, after who shakes hands with whom, after who looks at whom, they don't know the ground reality. BJP, Congress eyeing to set caste equation right in Barmer after BSP candidate's nomination rejected. To run such a big country, you need a strong leader: PM Modi. "In order to make India advanced, the country should have a similar government at the Centre and state to deliver new heights in the 21st century. It was because of the saffron sea that Sharad Pawar left the field. He is a big player and understands which side the wind blows," PM Modi. Congress General Secretary KC Venugopal on Rahul Gandhi's temple visit in Wayanad: As per pujari's directions he has performed all rituals for his grandmother, father, forefathers & victims of Pulwama incident. Congress General Secretary KC Venugopal on Rahul Gandhi's temple visit in Wayanad: Last time also he had wished to come here but because of security restrictions, he could not do it. Here is the place where the ashes of Rajiv Gandhi were immersed, in Papanasini river. More visuals from Wayanad as Congress President Rahul Gandhi performs rituals, after offering prayers at the Thirunelli temple. Prime Minister Narendra Modi is addressing a rally in Madha, Maharashtra. Prime Minister Narendra Modi will be addressing a rally at Madha in Maharashtra shortly. He will be also addressing rallies in Himatnagar, Surendranagar and Anand today. P Chidambaram tweeted, “It’s news that nothing was retrieved from Kanimozi's residence after the IT raid. How is that IT receiving tips only on opposition leaders!? The mark of Assembly elections is IT department's doctrinal partial activities.” Officials of the Income-Tax Department and a static surveillance team of the Election Commission on Tuesday evening carried out a search at the residence of Dravida Munnetra Kazhagam (DMK) candidate and Rajya Sabha MP Kanimozhi in Thoothukudi in southern Tamil Nadu. The action came less than 48 hours before the second phase of elections on April 18, which will be held in 97 constituencies. Congress chief Rahul Gandhi visited the Thirunelli Vishnu Temple in Wayanad, the second constituency he is contesting from apart from Amethi. Tamil Nadu: AIADMK ally and Vellore candidate AC Shanmugam to move Madras High Court today against EC's decision to cancel Vellore Lok Sabha polls. 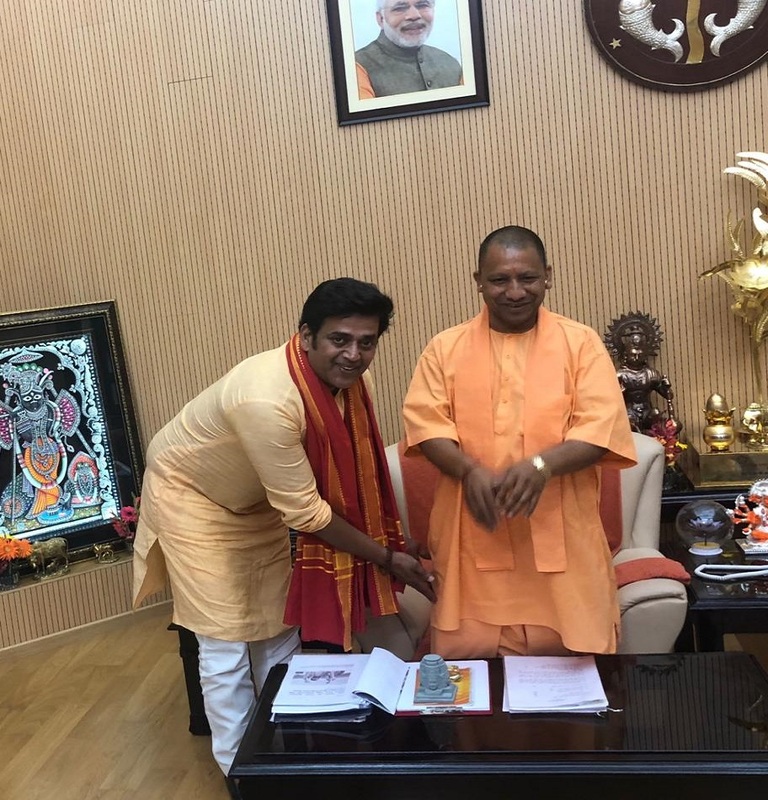 BJP candidate from Gorakhpur Ravi Kishan meets Uttar Pradesh Chief Minister Yogi Adityanath. TMC MLA from Chakdaha, Ratna G Kar: This time, it's even more challenging, but there’s nothing to be scared. I’ll go to each&every booth & we won't care about central forces, if they're pro-active, I'll request Mahila Morcha members to pick up broomsticks & chase them away. TMC MLA from Chakdaha, Ratna Ghosh Kar: If you want to win a war, there’s nothing fair or unfair, democratic or undemocratic way of winning. You've to win it by any means. I've seen in 2016 elections, how central forces beat up our boys, there was bloodbath. Defence Minister Nirmala Sitharaman on why she is not contesting Lok Sabha elections 2019: On the election, I think it is the party which decides who contests from where. So I go by that. I think that there should be consciously somewhere in the back of our minds when we're discussing in politics - Is that what is going to be the legacy we leave for the next generation?," Defence Minister Nirmala Sitharaman told ANI. RJD leader Tejashwi Yadav is scheduled to address rally in Begusarai and Araria. BJP candidate Rama Devi will file her nomination from Sheohar Lok Sabha Seat. BJP leader Radha Mohan Singh will file her nomination from Motihari. DMK candidate Kanimozhi on IT raids at the house where she is staying, in Thoothukudi: BJP cannot prevent my success through this income tax raid. The raid is anti-democratic, deliberately planned and tested, and no documents have been seized. "The CEC has implemented the order given by Delhi. There is admittance at some level that polls in Tripura on 11 Apr wasn't free and fair as claimed by BJP govt in state," Pradyot Kishore, Congress leader on deferment of second phase polling in Tripura East Lok Sabha constituency. India will see Priyanka Gandhi Vadra as 'thief's wife', said BJP leader Uma Bharti. EC issues notice to Congress MLA Kawasi Lakhma for controversial remark on EVM. Uttar Pradesh Chief Minister Yogi Adityanath will visit Ayodha today. Bundles of cash seized from shop in Tamil Nadu, police open fire to disperse AMMK cadres. Speeding up the poll campaign of his party in poll bound Odisha, BJP’s national president Amit Shah will hold a road show in Cuttack. Priyanka Gandhi Vadra will also hold a public meeting at Ambaji town under the Banaskantha Lok Sabha seat today. In his Day 2 of Kerala visit, Congress chief Rahul Gandhi will meet UDF leaders of Kannur, Kasargode and Kozhikode districts. He will then travel to Wayanad to campaign from the second constituency he is contesting from. PM Narendra Modi will address election rallies in Maharashtra and Gujarat.